I have come to accept that the boys’ annual dilation of their eyes is a challenging appointment. To prepare for our afternoon at the children’s clinic, I discussed with them that while eye drops are not pleasant, they are necessary for the health of their eyes. It is okay to be frustrated. However, it is not okay to scream and cry like they are on fire or to physically lash out at the poor staff member administering the drops (we have lived through both these scenarios). When it was time for the drops, I made T.Puzzle go first. I figured he would be the most belligerent and wanted it over as quickly as possible. My instinct was right. He acted as if we were burning his eyes with acid. He cried and screamed. I had to physically restrain him while the nurse pried his clamped lids open and precariously aimed the drops in the general vicinity of his eyeballs. Of course, Full Speed sat quietly in the corner watching this whole scene unfold. I gambled that while seeing his brother freak would be unsettling, he is old enough to reason through that eye drops don’t maim you. When it was his turn, he bravely took his drops. He tried so hard to keep still and even squeaked out a ‘thank you!’ when the nurse was done. It was the sweetest, cutest ‘thank you’ I had heard in a long while. 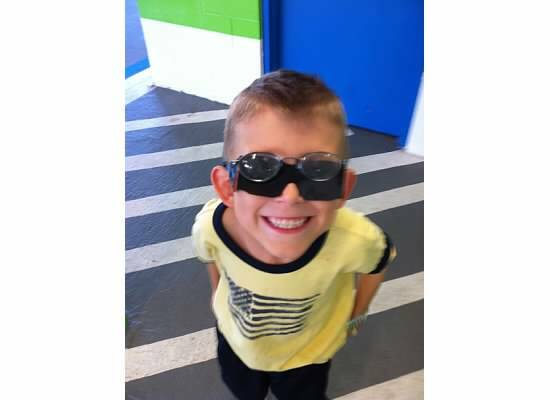 T.Puzzle shows off his winning smile and awesome shades worn to protect his dilated eyes. He promptly took them off about two seconds later.